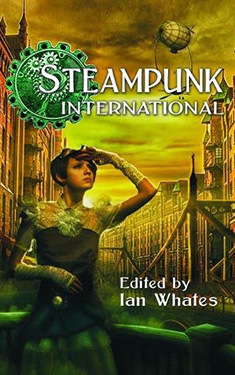 An anthology showcasing the very best steampunk stories from three different countries released by three different publishers in three different languages. From the UK, George Mann (a new Newbury & Hobbes tale), Jonathan Green (a new Pax Brittania tale), and Derry O'Dowd; from Finland, Magdalena Hai (winner of the Atorox Award and the Finnish Literary Export Prize), multiple award-winning Anne Leinonen, and J.S. Meresmaa (whose work has been shortlisted for the Anni Polva, Kuvastaja, and Atorox Awards); and from Portugal, Anton Stark, Diana Pinguicha, and Pedro Cipriano (winner of Fórum Fantástico's Choice of the Year Award).